For the heraldic symbol, see Tudor Crown (heraldry). 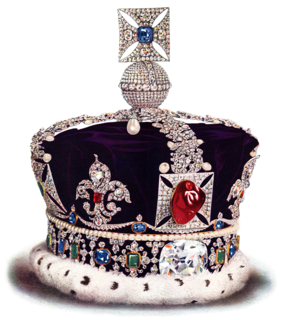 Its date of manufacture is unknown, but Henry VII or his son and successor Henry VIII probably commissioned the crown, first documented in writing in a 1521 inventory of Henry VIII's jewels, naming the crown as "the king's crown of gold". More elaborate than its medieval predecessor, it originally had two arches, five crosses pattée and five fleurs-de-lis, and was decorated with emeralds, sapphires, rubies, pearls, diamonds and, at one time, the Black Prince's Ruby (a large spinel). [note 1] The centre petals of the fleurs-de-lis had images of Christ, the Virgin Mary and St George, in an effort by Henry VIII to secure his position as head of the new Church of England. The crown was mentioned again in 1532, 1550, 1574 and 1597. After the death of Elizabeth I and the end of the Tudor dynasty, the Stuarts came to power in England. Both James I and Charles I are known to have worn the crown. Following the abolition of the monarchy and the execution of Charles I in 1649, the Tudor Crown was broken up and its valuable components sold for £1,100. According to an inventory drawn up for the sale of the king's goods, it weighed 7 lb 6 oz (3.3 kg). From 1902 to 1953, a stylised image of the Tudor Crown was used in coats of arms, badges, logos and various other insignia throughout the Commonwealth realms to symbolise the Crown and the monarch's royal authority. 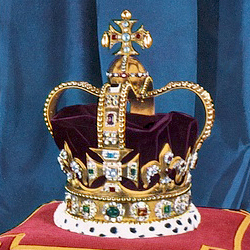 In 2012, a replica of the crown, based on research by Historic Royal Palaces, was made by the retired royal jeweller Harry Collins, using authentic Tudor metalworking techniques and 344 pearls and gemstones. It can be viewed as part of an exhibition in the Royal Chapel at Hampton Court Palace. Sherlock Holmes discovers the lost crown in The Adventure of the Musgrave Ritual by Sir Arthur Conan Doyle published in Strand Magazine in 1893. ^ Black Prince's Ruby was located at the top of the arches and surmounted by a cross. ^ Sir Roy Strong (19 November 1989). "A Vanished Realm: The Lost Treasures of Britain". The Sunday Times Magazine. p. 33. ^ Lucy Gent; Nigel Llewellyn (1990). Renaissance Bodies: The Human Figure in English Culture, c. 1540–1660. Reaktion Books. p. 14. ISBN 978-0-948462-08-5. ^ John Plowfeld (1521). "King Henry VIII's Jewel Book". In Edward Trollope. Associated Architectural Societies Reports and Papers. 17. James Williamson. pp. 158–159. ^ a b Jennifer Loach; G. W. Bernard; Penry Williams (1999). Edward VI. Yale University Press. p. 36. ISBN 978-0-300-07992-0. ^ Arthur Jefferies Collins (1955). Jewels and Plate of Queen Elizabeth I: The Inventory of 1574. Trustees of the British Museum. p. 266. ^ "Henry VIII's Crown at Hampton Court Palace". Historic Royal Palaces. Retrieved 5 February 2018. In modern heraldry, a royal cypher is a monogram-like device of a country's reigning sovereign, typically consisting of the initials of the monarch's name and title, sometimes interwoven and often surmounted by a crown. Where such a cypher is used by an emperor or empress, it is called an imperial cypher. 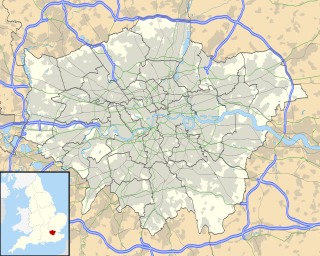 In the system used by various Commonwealth realms, the title is abbreviated as R for rex or regina. Previously, I stood for imperator or imperatrix of India. The cypher is displayed on some government buildings, impressed upon royal and state documents, and is used by government departments.